Designing a living room in a Mid-century modern style? We can't get enough of the clean lines, unusual patterns and uncluttered feel, but the Mad Men vibe can sometimes feel like it's difficult to obtain when you are doing up a living room on a budget. But don't let that deter you, you can still incorporate the Mid-century modern style into you living room without splurging. So if you love the mid-century ideas for your interiors but you're not exactly sure where to start, we've got some tips and tricks from vintage expert Kate Beavis to help you add that minimalist-yet-vintage vibe to your living room. Lightweight, thin-framed wooden furniture is an essential for a Mid-Century modern aesthetic. Opt for simple silhouettes, tapered legs and medium-stained brown wood. For a contrast to all the brown wood, make sure you add in plenty of pops of colour or accents of white. Try mixing and matching wooden furniture with resin or plastic furniture such as tulip chairs or a transparent coffee table. No Mid-century living room is complete without a beautiful stand-out chair – an occasional chair if you will. These strikingly simple chair designs soared to popularity during the mid-twentieth century and are definitely making a modern day comeback. The pared back look and the slimline shape makes for the perfect piece of furniture for both small livings rooms and more lofty spaces. 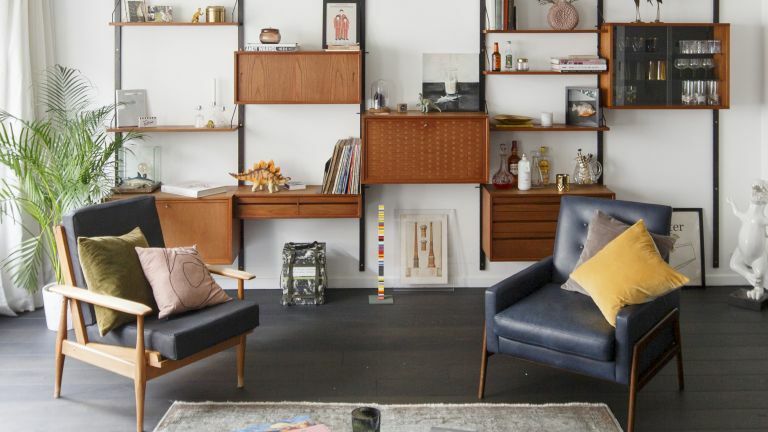 It may be the dream to fill your living room with one off vintage pieces, if your budget won’t stretch to that there are loads of great Mid-century modern inspired pieces available from high-street stores. Made.com is our go to site for anything Mid-century, and its especially great for Mid-century style sofas. Swoon Editions offers some amazing sideboard options – look for anything made from warm wood and with a tapered leg. Even Ikea has jumped on the bandwagon, anything from their Stockholm collection is going to add a ton of Mid-century aesthetic to your living room. We suggest mixing and matching remakes with the real thing to keep your living room looking authentic. Mid-century modern knick knacks can often hide on the shelves in charity shops so you can pick them up relatively cheaply if you are lucky. Look out for Scandinavian-inspired prints and quirky ceramics. Don’t forget to scour eBay for any bargains too. The pieces you find may need a bit of TLC but it will be worth it to save the £££s. To get a smarter finish to your Mid-century living room flooring, opt for a real wood floor such as parquet. Wool rugs in autumnal muted tones will add texture and softness to your room – you could even hang rugs on your walls as artwork. There are two essentials when it comes to decorating your Mid-century living room – a sunburst clock and teak mirror (or indeed a sunburst mirror and a teak clock.) Style them together to create a feature gallery wall or choose one large piece to stand alone. There are tons of remakes out there, like this starburst Newgate wall clock or this round gold mirror from H&M home. But if you are after the real thing, try online auctions like 1stDibs or keep an eye out at antique fairs. Again, there are plenty of replicas out there. West Elm has some incredible Mid-century modern inspired lighting, as does Heal’s. Fairs & Festivals: The Vintage Home Show , The Furniture Flea and Mid Century Modern all hold regular events in London, Leeds, Manchester and Bristol with some of the best traders in the UK who sell items suitable for all budgets as well as co-ordinating homewares. Look out for vintage festivals too, who have a large homewares arcade such as The Festival of Vintage. Shops: Keep your eyes peeled for emporiums who sell pieces from different sellers such as Space in Harrogate and Hemswell Antiques Centre. Want more Mid-century interior inspiration?